We have seen it, heard it, and experienced it. Bullying is something that many have gone through and may still be going through. Bullying is, according to stopbullying.gov, “unwanted, aggressive behavior among school aged children that involves a real or perceived power imbalance.” Bullies are those that seek to harm or intimidate others that seem weaker or more passive. 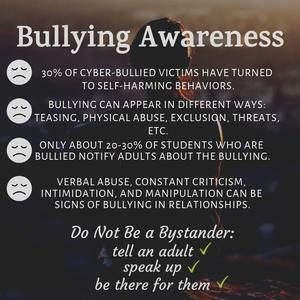 Unfortunately, bullying is common, especially in the schoolplace; however, if we can understand the reasons behind bullying, then we can surely prevent future situations involving bullies. There are three types of bullying: verbal, social, and physical. Verbal bullying is bullying that involves saying or writing hurtful things. Examples of verbal bullying include teasing, name-calling, inappropriate comments, or threatening to cause harm. Social bullying occurs when the bully intentionally hurts someone’s reputation or relationship. For example, the bully may leave someone out on purpose, tell others not to be friends with someone, spread rumors, or embarrass someone in public. The last type of bullying, physical bullying, involves hurting a person’s body or possessions. The bully may hit, kick, pinch, spit, push, take and break a person’s things, or make mean hand gestures. Especially with today’s technological age, bullying can also take place over digital devices such as phones, computers, and tablets. Cyberbullying is often seen on social media platforms where everyone has access to digital media like photos and videos. Bullying can happen anywhere, and to prevent it, we must know its implications and severity. 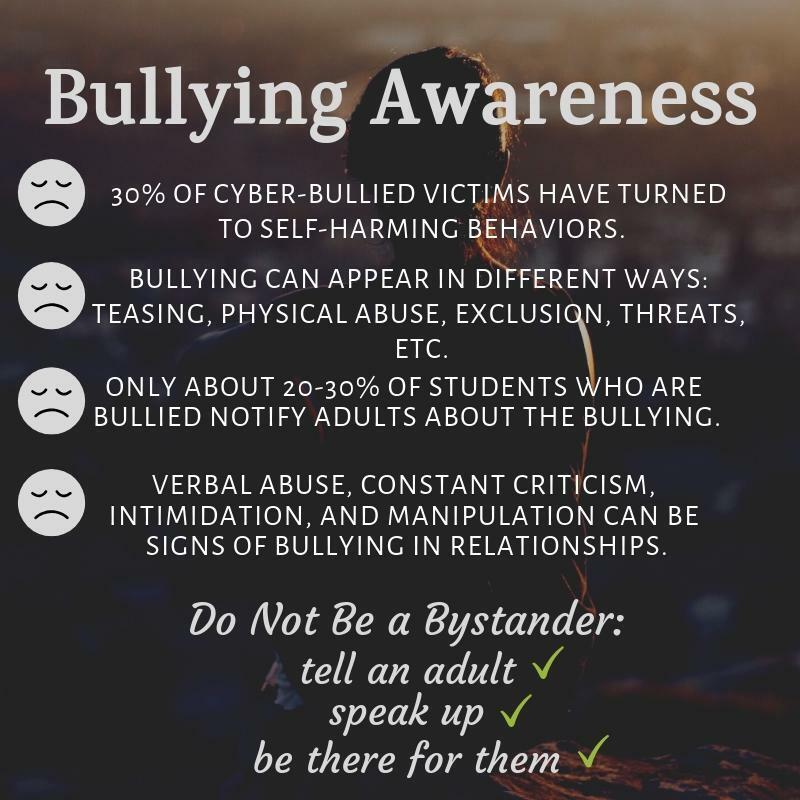 According to stopbullying.gov, 28% of U.S. students in grades 6–12 experienced bullying, and approximately 30% of young people admit to bullying others in surveys. These percentages may seem little when they are less than 50% of the student population, but when taking in the density of the population and how many students these numbers actually account for, the range is large. Even more perplexing is that only about 20 to 30% of students who are bullied notify adults about the bullying. Those that don’t notify adults of the bullying are scared to do so because of embarrassment, fear of the bully getting angry, or hopelessness towards their situation. Yet, we can’t let victims of bullying believe that they are alone or that they have no way out. Instead, we must take action and help those in need. When you see a person being bullied, stand up for him or her. Being a bystander is just as bad as being the bully when you let the victim continue to be harrassed. Make everyone feel inclusive, and don’t exclude anyone to make them feel embarrassed or hurt. Now, this may seem easy, but we often overlook this simple deed: respect everyone. When you give the same respect to others that you would want for yourself, an environment of acceptance and openness is cultivated. People are open to voice their opinions, thoughts, and ideas without fear of being rejected or made fun of. To prevent bullying, we simply just need to lend help. This help can come in the form of being there for someone, standing up for someone, allowing everyone to share their thoughts, respecting everyone, etc. No matter who, where, what, or when, we can prevent bullying – not just one step at a time but a leap at a time.